♬Liner Notes♬: Whoohoo! We made it to Episode150! It's almost all-new bands making their first appearance on PUTV this week with some of the hottest new sounds around from Summer Cannibals, Calexico, Colleen Green, Doomtree and much more! Notes: "Based in Buffalo... [Made Violent] were inspired as teens by the early ’00s rock revival (The Strokes, Yeah Yeah Yeahs), taking those bands’ penchant for straightforward force and melody to heart as they bounced between local bands. In early 2013, the band’s single “Wasted Days” began to get some traction overseas, which led to the band meeting that buzz with a well-received gig in London and eventually signing to StarTime/Columbia for their debut full-length, which is expected later this year." Notes: "On April 16th, Calexico is set to return with new [ninth] album Edge of the Sun via ANTI- Records. The follow-up to 2012’s Algiers features a long list of guest contributors, including Iron & Wine’s Sam Beam, DeVotchKa’s Nick Urata, Neko Case, and Grammy-winning Mexican singer Carla Morrison. As a preview, the Tucson folk rock band has unveiled “Falling From The Sky”, its charming, brass-strewn collaboration with Ben Bridwell of Band of Horses. " We heard from Calexico back on Episode022 in August 2012. Notes: "Fresh on the heels of a sold-out run of shows, San Francisco band Geographer have announced the forthcoming release of Ghost Modern, the outfit’s first full-length since 2012’s Myth. “I took a great deal of time crafting the songs for this album before arranging them,” said songwriter and multi-instrumentalist Mike Deni... The album’s first single, “I’m Ready,” was actually the last of 12 songs written for Ghost Modern. The track’s clear, distinctive vocals make it immediately distinguishable as Geographer..."
Notes: "With her former band [Austin's Wooden Birds] on something of an indefinite hiatus, [Leslie] Sisson has teamed up with Rozie Castoe and Karen Skloss as Moving Panoramas. Simplicity is the key ingredient again, but the trio’s sound is more expansive. Built around a repetitive groove and reverb-drenched harmonies, “One” sounds like a cross between Galaxie 500 and Cocteau Twins, though Moving Panoramas are more laser-focused. There’s atmosphere on “One,” but it comes with a sentiment that cuts to the core..."
Notes: "“TV is my friend and it has been/ Always there for me in time of need.” It’s the perfect companion to lead single “Pay Attention,” laying out why it’s always so much easier to crawl into yourself (or under the covers) and ignore all of the problems surrounding you. “TV” is a polished, infectious slice of slacker rock that’s done with a lot of style and a heavy eye roll, and it’s another really great track from [the West LA musician's second full-length]..."
Notes: "With their devil make care attitude, Seattle’s own Zebra Hunt have been crafting out the melodic strains of yesteryear since their 2013 debut EP, Beaches. With their brand new release, City Sighs, the trio have enhanced their scrumptious landscapes of sound – track after track of sophisticatedly grungy pop songs that have an enduring, timeless appeal. “Half Right” is a delicious appetizer for the City Sighs sound." "The Adventures of You and Me"
Notes: "Smart lyrics and catchy melodies abound on [Southend/Essex UK singer/songwriter] David Woodcock's debut album... recommended for fans of Randy Newman and The Kinks." I'd say there's some Courtney Barnett in there, too! Notes: ""Bhangale" by New York-based dhol and brass ensemble Red Baraat, featuring Delicate Steve. Their latest record, Gaadi of Truth, is out now." Notes: "[North London's] Beardyman is an absolute legend in the world of beatboxing, achieving a level of success pretty much unmatched in the mainstream circuit by anyone else in the scene. [Second full-length] 'Distractions'...was produced using the Beardytron 5000 mkIII, designed by the man himself, which enables live recording and mixing. The result isn't pretentious or over the top however, it is in fact a thoroughly enjoyable experience, showing that Beardyman isn't a one trick pony, and his journey into the more leftfield, glitchy electronic setting is successful and engaging." Notes: "Earlier this year, Minneapolis hip-hop collective Doomtree [dropped their third record and] the follow-up to 2011’s No Kings. Entitled All Hands... The 13-track effort was written while the collective was sequestered in a “cabin with no cell reception.” It features production from members Cecil Otter, Lazerbeak, Paper Tiger, and P.O.S. As the second preview, Doomtree has shared “Gray Duck”, a booming track featuring stellar and kinetic verses from all five MCs." We heard the Doomtree crew on Episode144 and they just came through town this week! Notes: "Mideau (pronounced “Mid-doh”) is an indie pop duo [from Utah whose] name is constructed from two words that loosely translate to “middle of the water,”... “Maude,” a single that appears on their upcoming debut, is one of those tracks that entice you with its familiarity before switching gears and going in a different direction. In a genre already saturated with too many boy/girl duos, Mideau proves they can stand out from the pack with a sound that’s as original as their name." Notes: "Austin is no stranger to jazz singers who convey a bygone era – Kat Edmonson just played guest DJ [on KUTX] after all. Hailey Tuck follows in that tradition, though the Austinite got her training singing in cafés and jazz bars in Paris and London. It’s a tale straight out of the movies, and it’s made even more cinematic by Tuck’s choice of material. On her self-titled debut EP, Tuck sinks her teeth into songs by Bob Dylan, the Zombies, Chet Baker, and Maroon 5. In her hands, Dylan’s “Don’t Think Twice” is transformed from an acidic goodbye into a playful kiss-off... catch Tuck when she returns to town for SXSW 2015." Notes: "Patti Smith is the guiding light for Summer Cannibals, in both name and spirit. The Portland quartet debuted with No Makeup in 2013, carving out garage-punk territory in a region that’s known for some pretty gnarly bands. 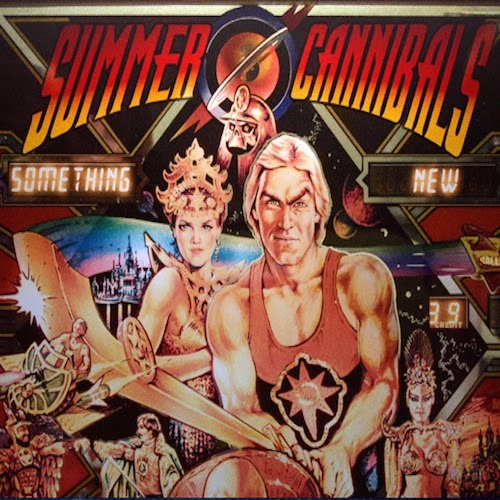 But for the new album Show Us Your Mind, Summer Cannibals make a big leap. Like Smith, the band understands the power of a good hook smuggled inside the snarl. The songs swagger now as frontwoman Jessica Boudreaux takes more of the spotlight. “I’ve been looking for something new / To keep my hands busy while I get over you,” she sneers on “Something New,” sounding equally menacing and inviting." New song/video from @TheVaccines: "Handsome"
@best_coast: So excited to share another song off our new album #CaliforniaNights! @BoozeLeprechaun Found @PumpUpThaVolume via #NewWorldNextWeek! @PumpUpThaVolume's Best New #Music Playlist on @YouTube!